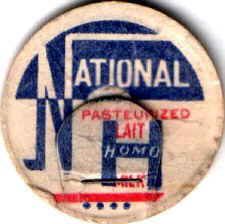 In the Mtl lovell's, this dairy is registered under the name "La Laiterie Nationale Ltée". The word Montreal has nothing to do with the registered name. It only identifies the city the dairy was in! 1931 - 1933 The FranklinDairy occupied this address. 1934 - 1935 The PeerlessDairy occupied this address. 1936 - 1940 The Ferme St-AntoineDairy occupied this address.